Tis the season to be jolly! The holiday season is in full swing all across the country, and you might be feeling stressed about taking care of your loved one with aphasia. This season is the perfect time to practice language and communication skills with your loved ones. In fact, parties, shopping, and opening holiday cards all offer a unique opportunity to work with your loved one re-building speech skills. 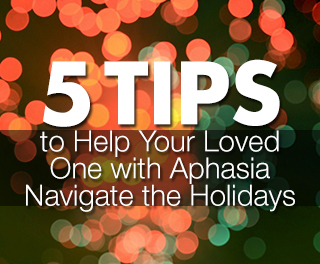 Here are a few tips for making the holidays merry with your loved ones with aphasia. Listen to Music: Music can be magical. People with aphasia can often sing better than they can speak. Singing familiar songs, can facilitate expressive verbal memory and positively impact cognitive recovery. People with aphasia can often sing words that they cannot otherwise articulate. This holiday, sing all of your holiday favorites together. Say Goodbye to Isolation: Aphasia can result in a feeling of isolation. Your loved one wants to be invited and included. Whenever possible, involve your loved one with aphasia in decisions about holiday traditions. For example, ask them where certain decorations should go, and which foods should be served at the family dinner. To facilitate their involvement, use visual cues like a picture of the object you're discussing or the item itself. This process can make it easier for him or her to make a selection. Ask For Help: Once a dish has been selected, ask your family member to help you cook. I recommend following a simple recipe or set of instructions together. Again, by presenting real objects or pictures will make this process a lot easier for your loved one. Additionally, make sure you have plenty of time, as communication comes easier for a person with aphasia when they are not rushed. Try to avoid speaking over or for your family member. Also, try not to speak down to your family member. You can do this by keeping your own speech simple. Spark Memories: Take time to look at holiday photo cards from family and friends together. Memories of important people and places can facilitate memories, and help your loved one to expand their utterances into basic sentences. Shop Online: People with aphasia (and without) can become easily overwhelmed in crowds of people and noisy environments. You may opt to shop with your family member online by using the online pictures to make decisions on what to buy, rather than heading out to the stores together. This way, you can take your time and not have to rush. I hope these tips are helpful. If you have additional ones, tweet us! Have a happy holiday season.